If Amblin Entertainment had dipped its toes into the superhero genre, perhaps circa 1984 or 1985, the result would look a lot like SHAZAM! It’s not a movie Steven Spielberg would have made, exactly, but director David F. Sandberg knows the chords well enough to play them with grace and even add some notes of his own. It’s a family film through and through, but it still has enough bite and an edge to it that it isn’t overly sentimental. When the emotions hit, they count, and they don’t feel overly manipulative or crass. Add to that a very funny script and across-the-board committed performances from the adults and the kids alike, and you have a winning DC film that proves that these movies should be entertaining and fun, not dour and overly serious. It’s striking to me that David F. Sandberg comes from a horror film background, and it pays off in a lot of ways here. Every scene has beats, and builds on what was before it, but instead of screams Sandberg brings in the laughter. There may be quite a bit of dialogue missed due to crowd reactions. Sandberg also knows how to deliver on the visuals, giving us just enough information and spectacle to keep everything moving. There are even a few effective jump scare moments in SHAZAM! that will surprise audiences. The third act is thrilling and exciting, not only due to the effects work, but because Sandberg and writers Henry Gayden and Darren Lemke give us characters to root for and to believe in. Asher Angel plays 15-year-old Billy Batson, a troubled foster kid who moves from home to home, unable to settle anywhere, having suffered a traumatic loss of his mother when he was younger. His travails bring him to the Vasquez home, an inclusive family that welcomes Billy with open arms, but he’s having none of it. 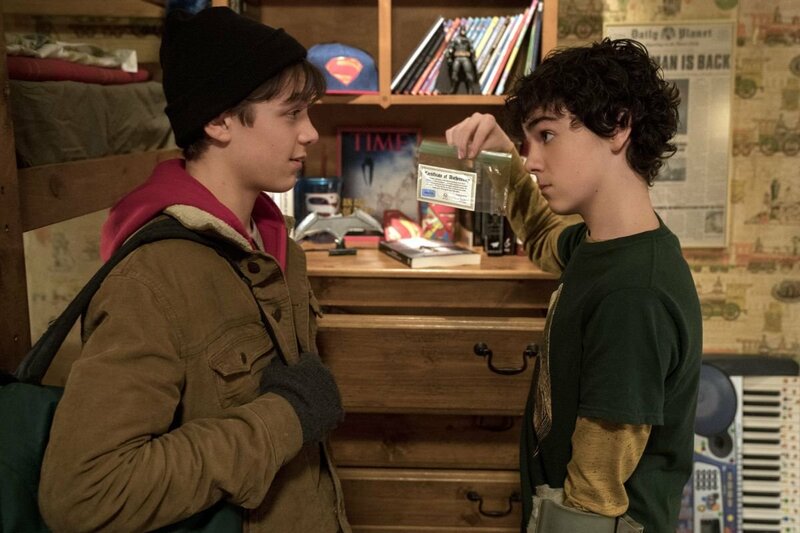 His foster brother Freddy (the terrific Jack Dylan Grazer) worships superheroes (as this is a DCEU film, Superman and Batman are reality here) and wants to connect with Billy as he doesn’t have many other friends, but Billy is mostly annoyed by him. When Freddy runs south of some bullies, Billy decides to take up for him, and this results in Billy meeting a powerful Wizard (Djimon Hounsou) protecting the universe from evil, and given vast superhuman abilities, transforming into the mighty Shazam (Zachary Levi). Unfortunately for Billy, there are others who seek Shazam’s power, particularly Dr. Thaddeus Sivana (Mark Strong), who as a young boy was offered the Wizard’s power but failed to attain it. Now Sivana has made pacts with other evil entities, and those entities hunger for the world. But Billy is still a kid, and he’s not equipped to deal with Sivana’s power. Shazam may be all-powerful, but Billy is not, and as his new family comes into danger, Billy is conflicted both within and without. 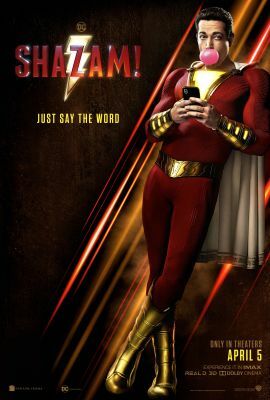 None of this would work without the performance of Zachary Levi, who fills Shazam with the giddy joy of having immense powers and yet still keeping to the naiveté and innocence of a young boy. People will make comparisons to Tom Hanks’ work in BIG (there’s even a callback to that film) but Levi gives us the added thrill of figuring out his own abilities and skills in this new body. There are some solidly funny moments as Shazam uses his powers to commit heroic deeds, but also acts like what a teenaged boy would genuinely do if given these new abilities. Jack Dylan Grazer makes for a great companion as well, inspiring Billy as well as educating him on what Billy calls “this Caped Crusader stuff.” Mark Strong’s villainous Dr. Sivana is also entertaining in his own right – Strong pokes fun at the bad guy persona in subtle ways. Goodness knows Strong has played enough bad guys throughout the years that he can see through all the nuances and angles, and he brings all of that to bear here. He’s a formidable foe for Shazam, but Strong also knows how to play it just shy of ridiculous and silly. He’s having a lot of fun and it shows. Tonally, SHAZAM! could use more focus – sometimes the movie goes a bit too broad or frivolous, but this is a movie with so much heart that you can forgive these minor missteps. SHAZAM! sometimes has all the logic of a Saturday morning cartoon, but it’s just so giddy about it that we don’t mind. If this is a course correction for the darker DC fare, there may be times that it sways a little too far in the other direction, but what is most important in this movie isn’t grandiose superhero posturing, but instead the simple joys of family, friendship, and finding one’s place in the world. The third act is pure Saturday-matinee stuff, the kind of cinematic glee we found in the best moments of those movies a lot of us grew up with in the 1980s. Even better, SHAZAM! invites everyone to have a good time. It doesn’t have a mean-spirited bone in its body. It’s well-paced, not too long, and never overstays its welcome. Even the scenes that are simple character moments pop, and Zachary Levi isn’t afraid to look silly if the moment calls for it. SHAZAM! has a big, goofy smile on its face, and you can’t help but smile back. This is a puppy dog of a movie, and it does exactly what it wants to do – give us heroes to cheer for, villains to hiss at, and laughs aplenty. It even throws in some welcome monster mayhem and raucous action sequences. In the pantheon of the genre, SHAZAM! is pure superhero entertainment.